Baby girls ivory dupion lace & cross gown with matching bonnet, the perfect robe for your baby girls christening or baptism day. 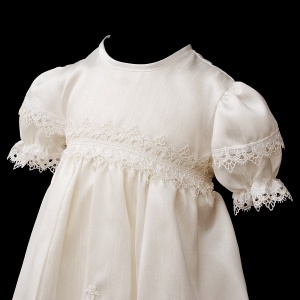 Gown: This ivory gown has a dupion bodice with a guipure lace trim to the waist and short sleeves . A satin sash beautifully ties at the back into a bow, with a discreet zip fastening. 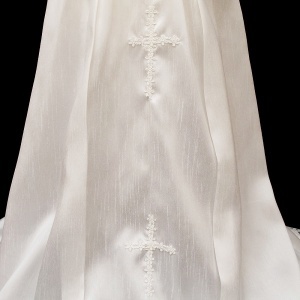 The skirt of the gown has two guipure lace crosses on the front, with a guipure trim to the hem. 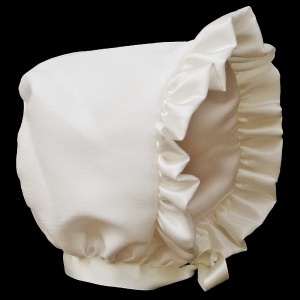 Bonnet: Matching ivory dupion bonnet with a frilly peak and a satin bow to tie at the front, completing this elegant design. 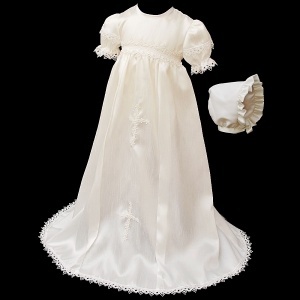 This beautiful gown & bonnet is made in England UK. The quality is outstanding and is made with the finest materials making this a perfect precious family heirloom for future generations of your family. 0-6 Months 28" 23" 18"
6-12 Months 30" 25" 20"